On March 5th 1933, a week after the Reichstag building was devastated by fire, Germany held its third federal election in just nine months. This election was neither free nor fair, corrupted chiefly by the brown-shirted men of the Sturmabteilung. SA troopers openly interfered in the electoral process, threatening party organisers, breaking up left-wing meetings, tearing down opposition party campaign posters and spreading scurrilous rumours about candidates. The pro-Nazi press also whipped up hysteria by publishing rumours of an imminent communist revolution. These rumours, coupled with Hitler’s seemingly decisive leadership in response to the Reichstag fire, led many citizens to abandon other parties and vote for the NSDAP. The Nazis increased their share of the vote to almost 44 per cent and won a further 92 Reichstag seats, giving them 288 out of 647 available seats. This was nowhere near the two-thirds majority Hitler needed to amend the Weimar constitution – but he was able to configure a majority by arresting communist and social democratic politicians and striking a deal with the Centre Party. On March 23rd, the Reichstag passed the Enabling Act, granting Hitler political powers not available to a German ruler since the days of Bismarck. The Nazis set about transforming Germany into an authoritarian one-party state. One of their first political targets were the Landtags (German state parliaments). In March, Hitler ordered that the head of each Landtag must be an NSDAP member. The following month he appointed Nazi governors in each of the states – and, like Hitler, these governors could rule by decree, bypassing the assembly. The Nazis now held sway over both nation and states; the state parliaments were as impotent as the federal Reichstag. In January 1934 the Landtags were dissolved and their sovereign powers were surrendered to the national government. The Nazis also moved on local governments and city councils, relieving these bodies of their control over civilian police. On April 26th 1934, the NSDAP reorganised German local government into 32 Gaus (shires). Each Gau was run by a Gauleiter, a high-ranking Nazi official appointed by the party. By mid-1934, the Nazis controlled almost all sectors of German political life. Outlawing other parties did not eradicate political opposition – but the Nazis had already taken steps to deal with troublesome groups and individuals. Earlier in 1933, Hitler authorised the construction of concentration camps: at Oranienburg, near Berlin, and Dachau, near Munich. Operated by the Schutzstaffel or SS, these camps were conceived as secure holding facilities for political prisoners. Communists and trade union leaders were among the first to be arrested and detained in these camps. Later, they were also used to house other political dissidents, anti-Nazi campaigners and priests – as well as ‘undesirables’ like homosexuals, criminals, pacifists, vagrants and Jehovah’s Witnesses. The concentration camps were brutal places where inmates were subject to military-style discipline and hard labour. There were hundreds of deaths from exhaustion, malnutrition and incidental violence, though there were as yet no intentional extermination facilities. By 1939, both Dachau and Oranienburg held about 25,000 prisoners. Hitler’s political supremacy was now constrained by one institution: the presidency. In real terms, the ageing Paul von Hindenburg was no problem: he approved the Reichstag Fire Decree and Enabling Act without objection and did not interfere in Hitler’s political reforms of 1933 (other than complaining about the treatment of Jewish World War I veterans). Hitler viewed Hindenburg as a redundant figure from a bygone era. 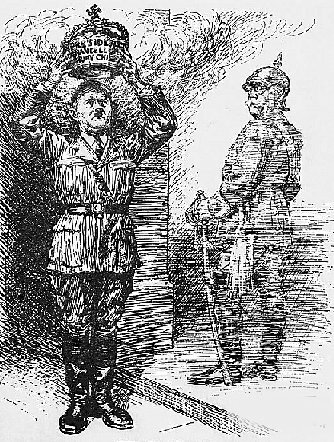 He continued to show respect and deference to the old man – in public at least – to avoid any tension or difficulty with the Reichswehr. The Nazi leader also knew Hindenburg was suffering from terminal lung cancer. This eventually took his life on August 2nd 1934, removing the last vestige of the Weimar political system and clearing the way for Hitler’s political supremacy. Shortly after Hindenburg’s death, Hitler merged the presidency and chancellorship into a new office. The new leader would be titled as the Fuhrer and would act as head of state, head of government and commander of the armed forces. Hitler convened a plebiscite (vote) to obtain public endorsement of this constitutional change. Almost nine-tenths of Germans approved of the measure, though there was some suggestion the plebiscite was rigged. Hitler was now Fuhrer of all Germany, and his rise – from obscure Bavarian radical to absolute dictator of the German nation – was now complete. 1. The Enabling Act gave Hitler wide-ranging powers to impose Nazi control over German government and society. 2. In April 1933 he began reducing the power of Landtags (state assemblies) which were abolished the following year. 3. Local government was also reorganised under Nazi control, with police powers passing to the SS and the Gestapo. 4. Trade unions and political parties were outlawed in mid-1933, with dissidents sent to concentration camps. 5. On the death of Hindenburg, Hitler merged the presidency and chancellorship and proclaimed himself the supreme leader. J. Llewellyn et al, “Extending Nazi control”, Alpha History, accessed [today’s date], https://alphahistory.com/nazigermany/extending-nazi-control/.